If the movies teach us anything, it’s that the U.S. government has a small room with a few stressed-out bureaucrats worrying about every disaster that might arise. Volcanos? Absolutely. Pandemic influenza? You got it. Today, we heard from the killer asteroid team. The bad news? NASA is not going to be able to find all the asteroids big enough to cause serious devastation on Earth by 2020—or even 2033. Also: For a hypothetical attempt to send a spacecraft to divert an seriously dangerous incoming asteroid, we’ll need a ten year heads-up to build it and get it to the asteroid. The good news? They’re working on it. “If a real threat does arise, we are prepared to pull together the information about what options might work and provide that information to decision-makers,” Lindley Johnson, NASA’s Planetary Defense Officer, told reporters. The meat of the announcement today from was the conversion of a 2016 strategy document (pdf) produced by the Obama administration into a set of coordinated goals (pdf) across the government, from the Federal Emergency Management Agency to the Department of Energy. 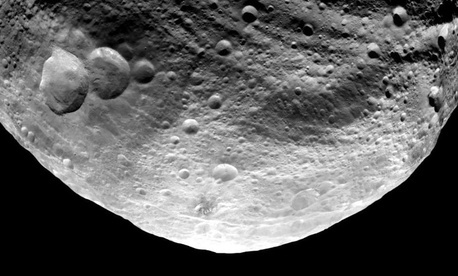 Sensible stuff— figuring out how better to track asteroids; predict their behavior; re-route or break them apart; and work better with international partners to routinely improve the world’s ability to do this. Even though asteroid impacts are rare, they’re serious. You might remember the 2013 impact of a meteoroid in Chelyabinsk, Russia, which exploded in the air and released enough energy to injure a thousand people, mostly due to shattered windows. It was fairly small: Just 20 or 30 meters across, which means the network of telescopes we rely on to hunt asteroids didn’t spot it before it entered Earth’s atmosphere—and probably won’t find others of that size, either. The chart above shows that we’ve found most of the asteroids that could end life on Earth, but we’ve found far fewer of the smaller kind, which could still devastate life for millions of people. NASA cites the 1908 airburst of a 40 to 60 meter asteroid over Tunguska, Russia, which leveled 2,000 square kilometers of forest. If that were to happen over New York City, it would cause millions of casualties. NASA says it would be unlikely to detect an near-Earth object of this size with more than a few days of warning. That’s why the first big action item in this report is for NASA, the Air Force and the National Science Foundation to come up with a plan to invest in new telescopes to hunt these asteroids. The amount of funds available for Planetary Protection is increasing, with the Trump administration requesting $150 million from lawmakers next year, mostly to fund a mission to demonstrate a spacecraft called DART that could deflect an Earth-bound asteroid. But strangely, Johnson would not discuss specific technologies for hunting asteroids during the media briefing on the report. One option is NEOCam, a proposed telescope that would hunt for asteroids. But that program may be under stress now that important questions are being raised about its predecessor project, called NEOWise. That effort used a different telescope to measure near-Earth objects, but Nathan Myhrvold, a former Microsoft technologist with a Ph.d in physics, has challenged the results, publishing a new peer-reviewed paper arguing that they are far more uncertain than NASA’s researchers suggest. But as the graph above shows, the best is far from good enough.